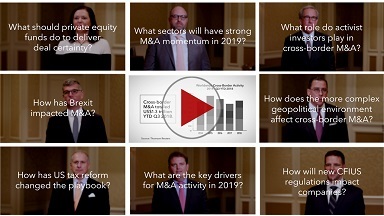 Click through to watch videos of panelists discussing trends and outlook for cross-border M&A in 2019. A raft of legal, regulatory, and economic forces have created a dynamic environment for cross-border M&A in 2018, which are expected to continue to drive M&A activity in 2019. Latham & Watkins and Credit Suisse hosted advisors, C-Suite executives, and board directors to discuss critical factors, as well as opportunities and challenges, impacting cross-border transactions. The video gallery highlights some of the key topics covered at the conference, including regulatory challenges, legislative developments, and geopolitical factors.